Since November, it’s been snow . . .
and Snow . . .
We live in Minnesota, an hour northwest of the Twin Cities. 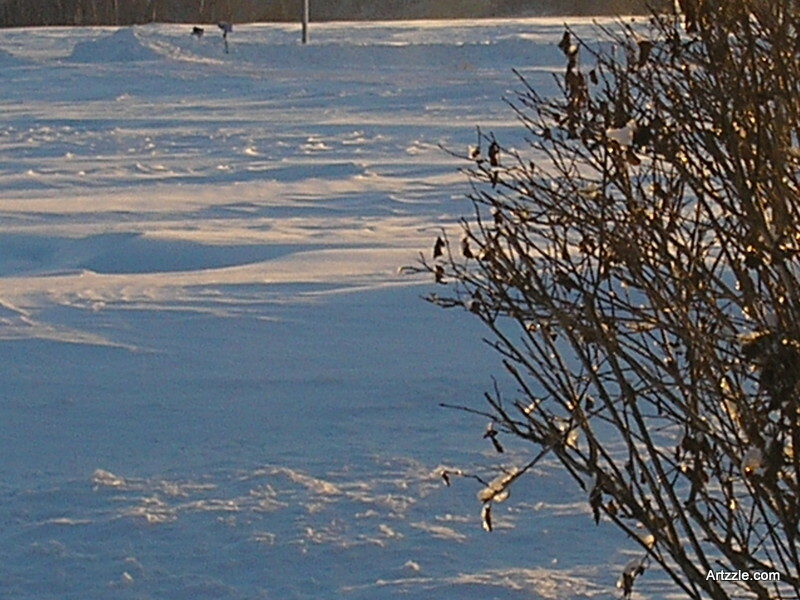 We’ve had 37″ of snow so far and our average amount at this date is 21″ or so. It isn’t a monster below . . . it’s my Mister . . . after digging out. 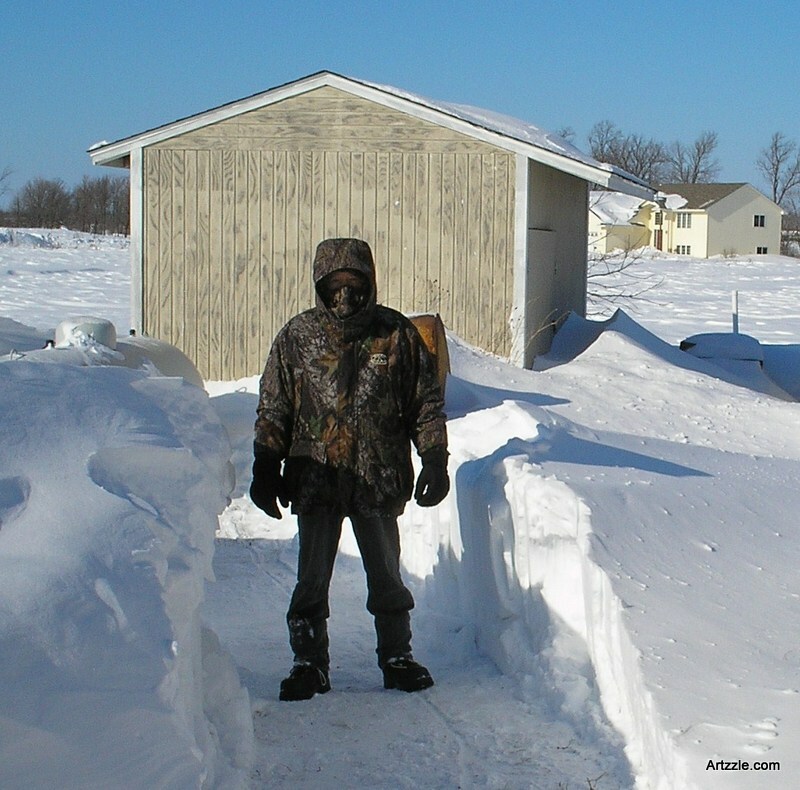 Digging out his truck that was stuck for two days in a 4′ drift at the top of the driveway. Digging out the propane tank so they can deliver the 175 gallons of gas at a $595.16 cost. 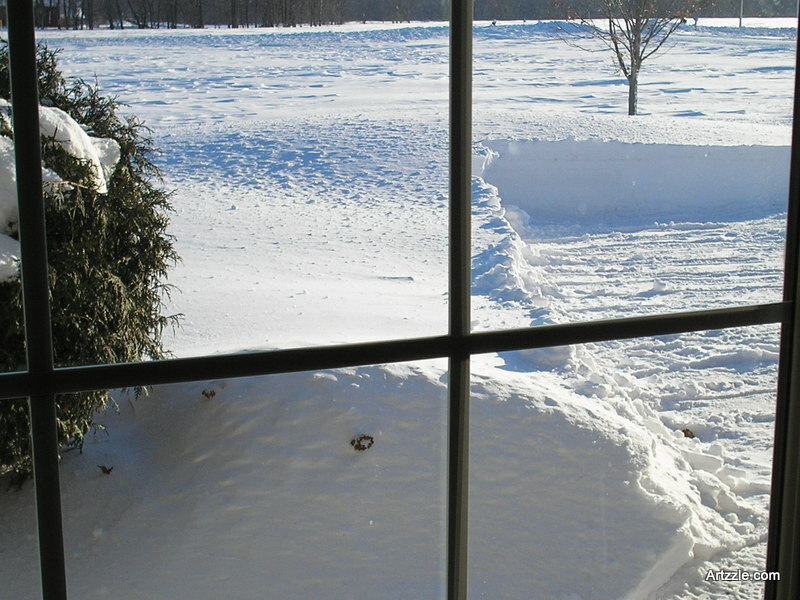 Digging out a space to start the snowblower and find the rest of the driveway. They say you can’t avoid death, taxes . . . or the weather. We already filed taxes and will even get a bit of a refund. The snowblower works fine, and winter does have to end . . . sometime . . . RIGHT? So, we’re trying to brighten up our spaces a bit. 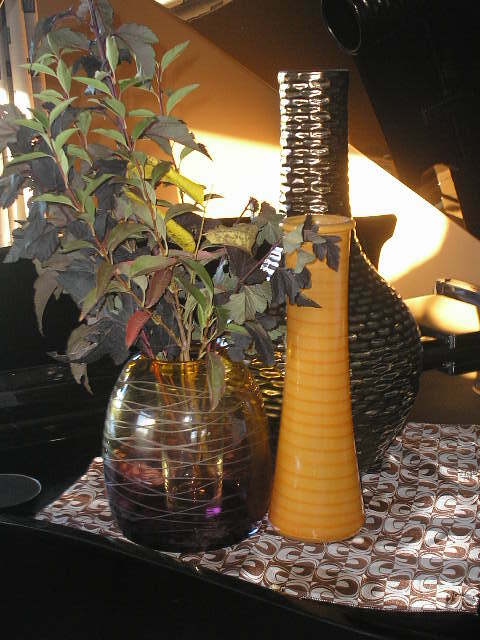 I put a new runner and scarf on the table, brought out vases in those colors and put a few houseplants in them. Do you think it helped a little? Even so, it’s not enough! Problem is, now I don’t like all our brown and beige walls. That’s a pretty big problem too, because I just painted those walls last year around this time. Hey, I love new paint, I just don’t love putting it on the walls! And I keep seeing all these other wonderful colors everywhere. Leslie over at the SEASONED HOMEMAKER brighten up with some pretty new toss pillows. Leslie’s great at sewing though . . . me, not so much! Look at this recent HOUZZ update. 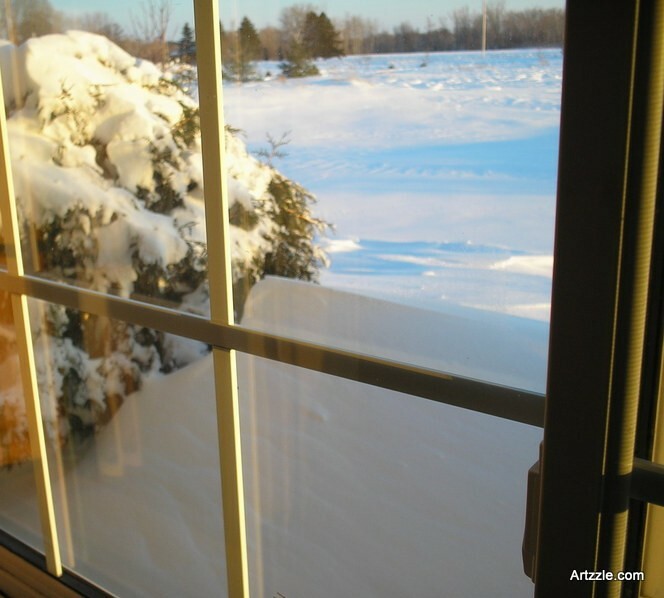 BECKY DIETRICH, HOUZZ Contributor is one of my favorite writers over there. Centsational Girl, is into blues, grays and all kinds of fun today, TAILORED TOUCHES TO THE MASTER bedroom. I’ll need to be satisfied with daydreaming for a bit, as we have to handle that propane bill first. Are you fending off winter blahs? 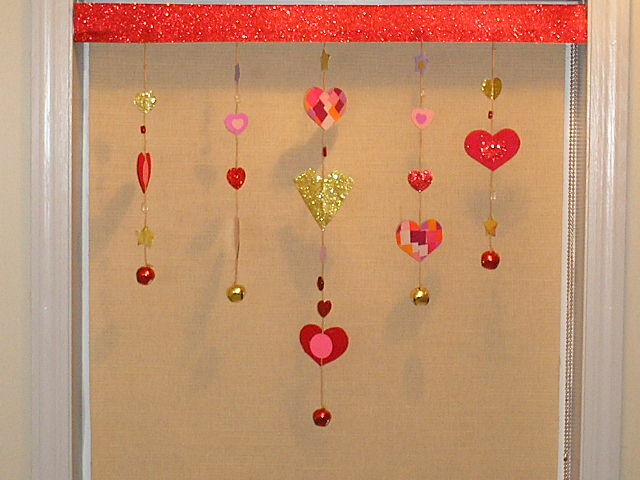 Let me know how, because YOU KNOW I love hearing from you! Meantime, stay warm, stay safe and . . . don’t stress, just start something! This original article “ENOUGH ALREADY” appeared first on Artzzle.com. No included content or photography can be used elsewhere without specific permission and/or accreditation. 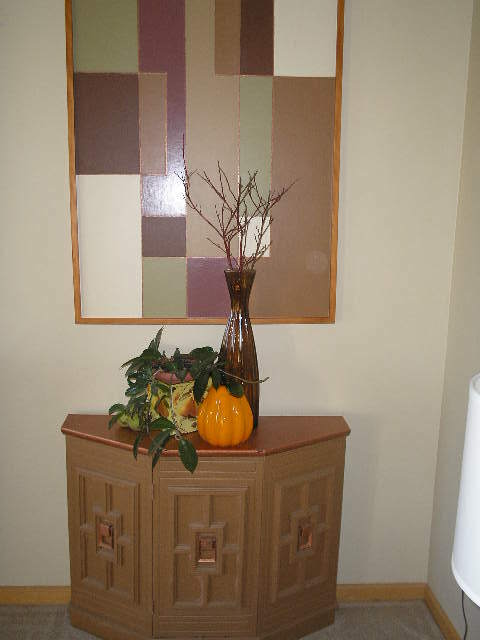 Autumn is upon us, and it’s a favorite season for decorators. 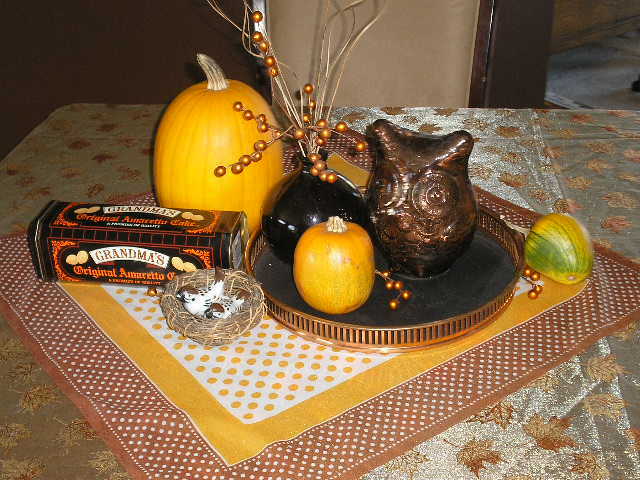 There are lots of inexpensive and even free accessories out there, that make it easy and fun to add a little Fall flavor to your home. And if all that comes to mind is black and orange, remember that Halloween is just a small part of the season. 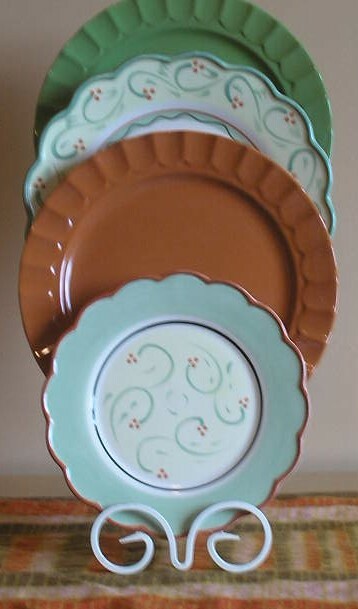 Above, several collected items are grouped for a table arrangement. The artificial orange berries add some texture and Fall color. The table is covered with a shimmery leaf patterned fabric, and then a Fall colored scarf centered to ground the vignette. Bring natural elements in. 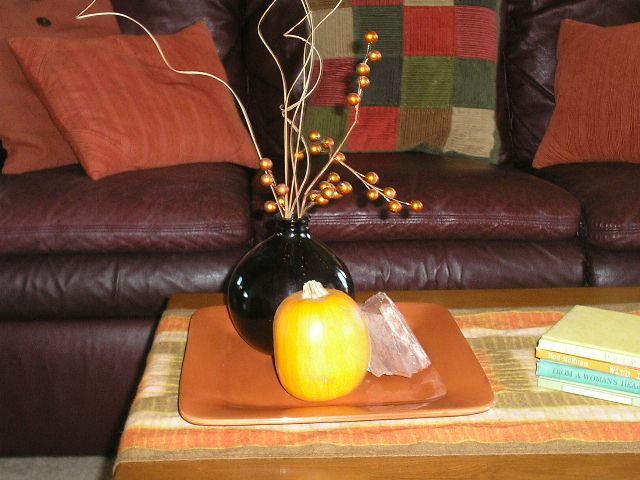 Branches of colored leaves, pumpkins, gourds and even pretty rocks. 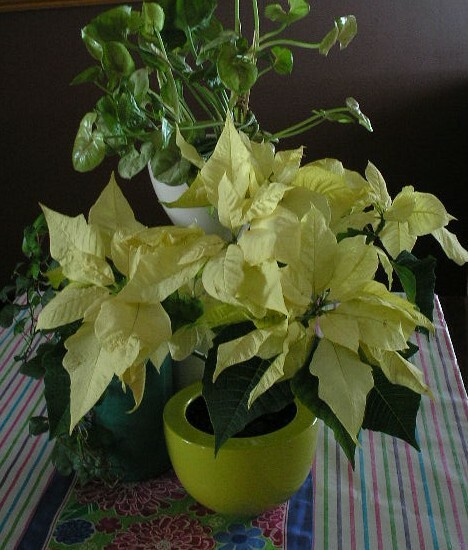 Below, the same arrangement is adjusted a bit with a vase and multi-colored branches, adding height, texture and more interest. The grand piano is opened to display beautiful glass pieces and colored leaves. 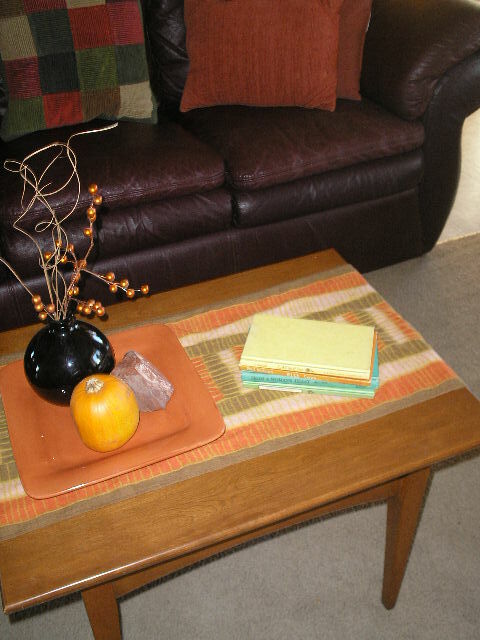 A wooly scarf serves as a runner on the coffee table. 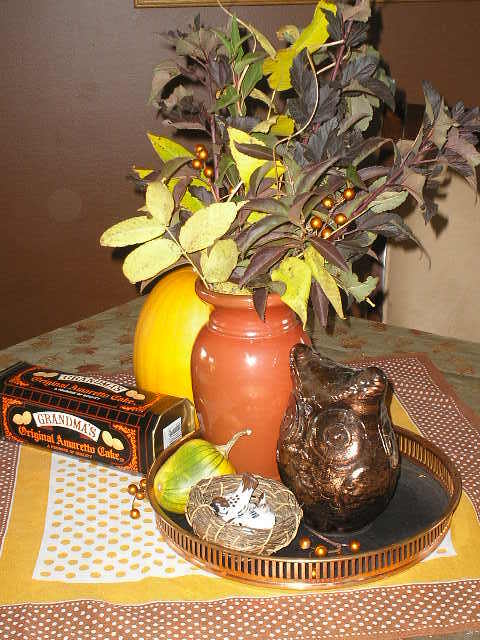 A pretty orange plate holds a tiny pumpkin, unusual rock and and petite vase with berries. A few little books to the side balance the vignette. Toss pillows in colorful textures and patterns keep the Fall colors going. Red twig dogwood branches below stretch from a brown glass vase, and are accompanied by a plant in a colorful container (a thrift store bargain at $0.25), a glass pumpkin and some green walnuts right off the tree. 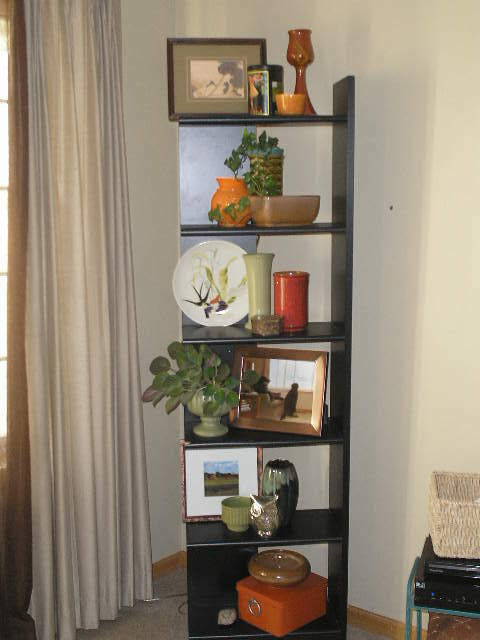 A corner shelf unit presents an interesting collage of items in Fall subject and colors. Note how many arrangements here work from three main pieces. Again, the magic number 3 is so helpful. Employ everyday items like scarves, books and plants. Just use your imagination and have fun with it. Let me know if you have comments or questions. Email followers will have a Reply section at the bottom of this post. Online visitors can click the little bubble at the top right of the title to reply. Thanks for visiting. If you enjoy Artzzle.com be sure to spread the word about us. And try not to stress too much with any project, just have fun and start! 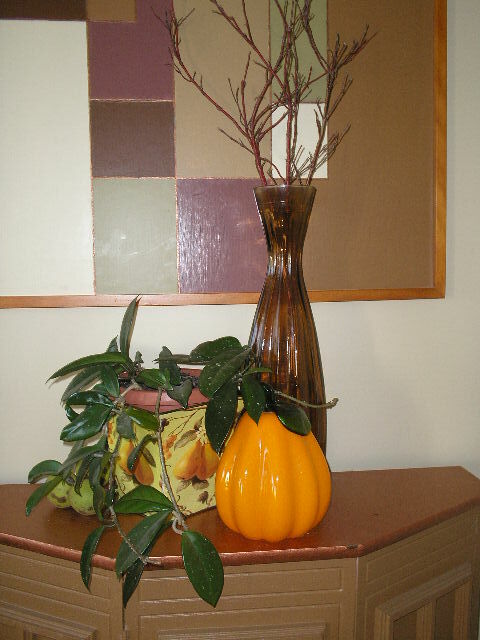 This original article “Fun Fall Decorating” appeared first on Artzzle.com. Are those Fall colors coming to play at your place yet? 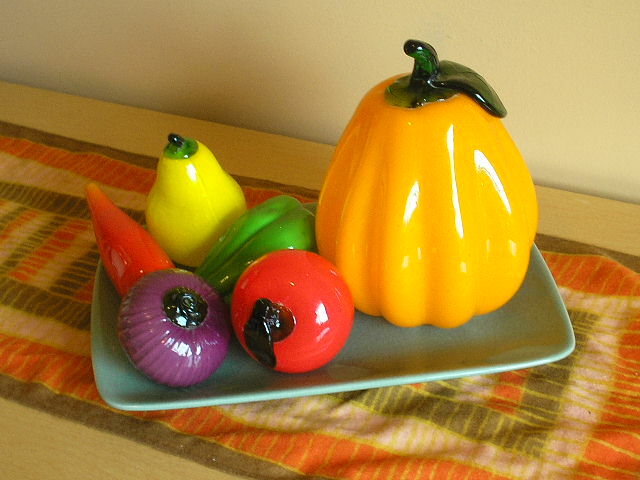 Karen over at Dogs Don’t Eat Pizza started a great Tuesday Talk group, and today’s topic is about Decorating for Fall.